Get the most out of your avionics with a Qref checklist. This quick-reference card helps you master your GPS quickly. It features common actions, helpful tips, and an indestructible format. Pros: A good checklist for new users to have available. Review: The primary usages for the Garmin 430/530 should be listed in numerical order based on their importance. Color coding the subjects, the elements, and the critical points would be most helpful too. The lamination is almost "cloudy" and a little hard to read with the sun shining on the card in the plane. Pros: Very simple; what Garmin should have supplied with the unit. 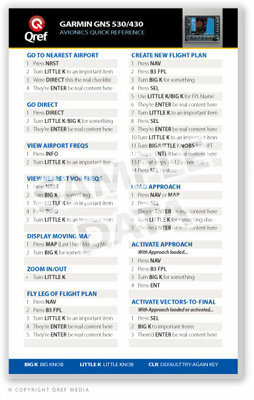 Review: Good, basic instructions in checklist format for comm & flight plan entering. Garmin's published procedures are always cryptic, often incomplete & occasionally wrong; this card helped my copilot master the 430.
Review: Nicely organized and well made. I just missed the procedure to save a random point as you fly over it. As a VFR rated helicopter pilot I also noticed that it's more dedicated to IFR pilots since the 500 series have all the resources for this kind of flight. Review: Don't buy a book all you need is this card ! If you can work a toaster oven or a microwave then all you need is this short-cut guide and you're all set. Cons: Too hard to find what you need quickly on the card.